FRANKFORT, Ky. -Thirty-nine years ago, a young man joined the United States Navy after a friend, who had recently enlisted, suggested the idea. “My intention when I began this journey was to just do my four years in the Navy and earn my G.I. Bill,” Graetz said. He served as an aviation structural mechanic, then separated from the Navy after his first contract ended. Army Chief of Chaplains Maj. Gen. Donald L. Rutherford, presents Army Brig. Gen. David. 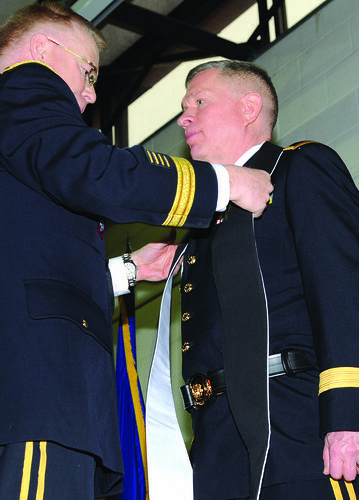 E. Graetz, assistant to the Army chief of chaplains as the National Guard liaison, with a stole during his promotion ceremony at Boone National Guard Center in Frankfort, Ky., Jan. 11, 2015. The stole formally symbolizes the responsibilities assumed with Graetz’s promotion. For more photos, visit our flickr site here. Now, Army Brig. Gen. David. E. Graetz serves as the assistant to the Army Chief of Chaplains, Maj. Gen. Donald L. Rutherford, as the liaison for the National Guard. 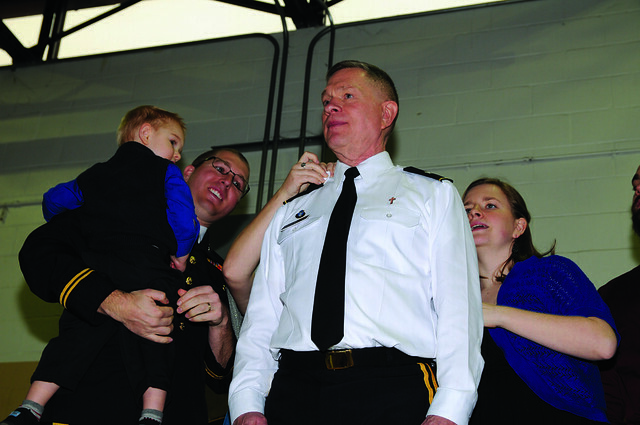 Graetz received his promotion from Kentucky’s Adjutant General, Maj. Gen. Edward W. Tonini, with the assistance of his wife Gayle, and his daughter Anna, during a formal ceremony in Frankfort, Jan. 11, 2015. He credited God and family for his military success and presented his family with gifts of appreciation during the ceremony. Graetz has gone on to not only support, but also influence, his family. His son-in-law, Army Capt. David Miller, chaplain assigned to the 1120th Transportation Battalion, Arizona National Guard, named Graetz as his mentor. For now, Graetz plans to continue his support of Soldiers in the Army National Guard by utilizing his position to ensure their well-being.